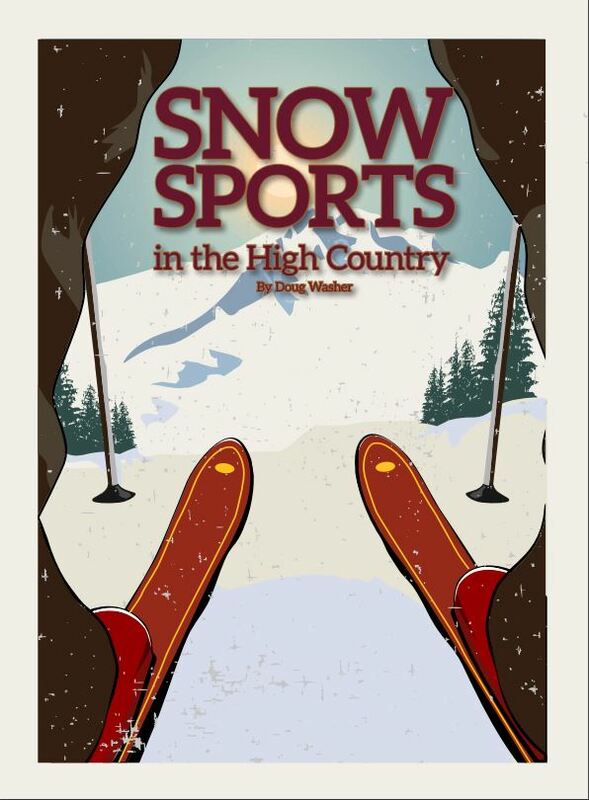 The first official ski resort in North Carolina opened back in 1961—Cataloochee Ranch and Ski Area. And then by 1970, there were others- Appalachian Ski Mountain (1962, as Blowing Rock Ski Lodge) Seven Devils (1966, later re-named Hawksnest, and now only offers tubing), Beech Mountain (1967), Sugar Mountain (1969), and Wolf Laurel (c. 1970, later renamed Wolf Ridge). Four other small slopes also were developed, but are now defunct. Although the North Carolina mountains have winter weather that can rival the northern states, there is really not enough natural snowfall to keep sufficient coverage on the slopes for an entire season. The invention of artificial snowmaking made southern skiing a reality since the region does have frequent sub-freezing temperatures, especially at night. Snowmaking is an art, and each mountain has a team of experts who study the conditions and optimize the snow output, and at the most economical cost. But it is expensive to produce snow. Electrical costs, water resources, and building and maintaining the infrastructure are always major factors. Man-made snow (and it is snow) has some advantage over natural snow. It can be more durable and resist packing down and deteriorating as quickly as natural snow, under heavy skier traffic. But in most cases, made-made snow will “ski” just the same as natural snow. Today’s quantity and quality of snow, as well as the “grooming” (the smoothing of the surface with special tractors) are vastly improved over the early days. “Snowsports” has become the accepted term to include both skiing and snowboarding. The snowsports season in North Carolina can be as lengthy as many resorts in the Northeast or Western states. October 31st, in 2012, is reported to be the earliest opening date, and April 1st, 2018 is the latest closing date for a regular season. Both of these records were achieved by Sugar Mountain, near Banner Elk. A typical season runs from about Thanksgiving to the second week of March, and nature gives us only the amount of cold weather that she thinks we deserve every year. “Ski Resort” is now really a historical term, since snowboarding has grown enormously since the mid-1990’s, and roughly equals skiing in overall popularity. But ski resort is a bit simpler to use as a term, so that’s what I call them. Snowboarding came along gradually. I saw my first snowboard in 1979 at a ski shop in Boone (an early Burton model, with rubber waterski bindings). The first two snowboarders I saw were at Sugar Mountain about 1984, and they were having a hard time of it. Snowboarding got the cold shoulder for a few years at many resorts. Hawksnest, in the town of Seven Devils, was an early adopter of the sport, in the late 1980’s if I recall correctly. By around 1993 or so, all the regional resorts were getting “on board”. with no one he knows, especially when they can barely speak the language (on the initial trip, anyway, with maybe only $5 in my pocket. Ahh.. the 60’s. Dangerous times, but no one knew or cared. But it did help me develop independence to better enjoy traveling to new places. Living in Arkansas for my teen years, I did not get to ski very often. There was a small ski resort in Arkansas at the time (Marble Falls, near Harrison), and we went there a couple times. And a couple trips to Ontario Canada to visit relatives, where we squeezed in a day of skiing here and there. Then I transferred to Appalachian State in 1979 and started skiing as much as I could afford (and it was a lean time for me). I recall finding a discount coupon and with my student pass I could ski at Seven Devils for $4.00 on a weekday. I seemed to always pick the most brutally cold and windy days or nights to go, and at least once found myself the only paying customer on the hill. The chairlift operators weren’t too happy about having to leave their warming hut just to attend the chair for one customer. I always thought I might follow my dad as a ski patroller, but as it happened, I had a college summer job as a “canoe rental technician”, and one of my fellow workers was the assistant director at Sugar Mountain Ski School. He said, “Doug… you want to be ski instructor”. So, thanks to him, I now have 37 consecutive seasons under my belt, as a Sugar Mountain ski instructor. I started also teaching snowboarding in 1999, after some gentle persuasion for a few years from my longtime boss, Snowsports School Director Len Bauer. As an additional note, I’ve made it a lifetime goal to ski as many resorts as possible. My completed list is now at 87 resorts, including all of the Top 50 in North America, as ranked by Ski Magazine. I like to think I’ve skied just about every major slope in North America (still a couple more to go in British Columbia, and a couple in New Hampshire). I often get asked what snow sport I like better. And I answer: “whichever one is on my feet”. I really enjoy skiing and snowboarding equally, and I have been fortunate to have the time and location to develop my skills in both sports. But time and money are typical constraints at various times in our life, and some folks might try both, but then need to move forward with one or the other. Each sport has its own small advantages and disadvantages. Also note that for snowboarding, we often refer to doing the sport as “riding”, and a snowboarder as a “rider”. But if you do one sport already, try the other one! Soon might be the first day of your snowsports life…. will you be ready? Preparation: The usual suspects: hat (or MUCH better- a helmet! ), gloves or mittens, underlayers, overlayers, water-resistant pants, either with bibstyle, or with suspenders. Now comes the unusual suspects: ONE pair of THIN socks is more comfortable than thick socks or double socks, and your skin will have better circulation and stay warmer due to less constriction inside the boot. Thin socks create less pressure points that cause pain or blisters. Goggles will be a must if it is cold, windy, snowy, rainy, or nighttime. If you are skiing in the springtime, it is suggested you carry also a lighter pair of gloves, (lightweight work gloves are great), in case it gets too warm. You should also have a thinner jacket available, for when the sun heats things up. And finally, I typically use a soft fleece “turtle” that keeps my neck warm and can be pulled up over my lower face as needed. Sunscreen is critical! I’ve learned to apply it every single ski day before I leave the house, whether it is foul weather or not. I’ve been caught unprepared in lessons where the dark skies leave for 15 minutes and the sun comes out briefly, and I’m in serious jeopardy of sunburn. Funny stuffed hats: You’re on your own with these. Wear at your own risk (of potential lack of coolness). Neoprene face masks: Wear at your own risk. Weren’t cool—ever. Ball caps: Not ideal, but still more common than they should be (remember – helmet is the way to go). Loose scarves: NOT recommended- ever! They can catch on lift equipment, trees, poles, etc. For really cold days, I like the fleece full-face balaclava with drawstring adjustment. Helmet: A must for kids. For adults – highly recommended. You can usually rent helmets. Snug up the chin strap, otherwise, the helmet is useless. Helmets should have a good fit, and not be easily moved around as you grab it with both hands. The front of the helmet should be just over the eyebrows for most people. But consult the helmet manufacturer or sales & rental shop for specific fit and safety requirements. Boots: After socks, boots are the most important part of the equipment list. For rentals, insist on a pair that is in good condition and dry on the inside. Ski boots are stiff, and will feel unusual at first, but stick with it. Take shorter steps to avoid slipping. All boots should fit snuggly but should not be uncomfortable. Rental boots are sometimes a crap shoot to expect perfect comfort, but if you buy your own eventually, you should be able to find boots that fit very well and will provide better performance. Snowboard boots MUST be laced up snuggly! If not snug, don’t even try the sport. A helpful trick is to attach your slope pass (lift ticket) to a non-detachable clip on your pants, instead of attached to the jacket. This will allow you to change jackets if necessary (warm days), yet always have your pass with you. And it keeps the ticket from flapping under your chin all day. Skis or Snowboards: Modern skis are much shorter and have more “shape” than ones from olden days. A very basic rule of thumb on ski length is: with ski vertical resting on the ground – somewhere around chin high for adult beginners, up to eye or forehead level for advanced skiers. Child recommendation is typically from chest to chin level. You can go online to find sizing charts for your height, weight, and skill level. Skis and snowboards are always sized in centimeters, which makes it easy to understand if you are from any country outside of the U.S. One inch is equal to about 2 ½ centimeters. Snowboard length is traditionally somewhere between chin and nose. For a beginner, the exact length of the ski/board is not especially critical. If you buy your own equipment, you can do research online, and a good sports shop will give excellent advice on dialingin the best length for you and the brand and model you are considering. Bindings: These hold your feet on the skis or board. For beginners, nothing really needs to be addressed. They are all pretty good these days. When you buy your own equipment, you can research your choices till the cows come home. Ski bindings allow the foot to release if a fall occurs (and most often will release when you fall, as the force on the ski increases). Snowboard bindings keep your feet attached, but this is not a problem in most fall situations. Probably the biggest difference between skis and snowboards is how the feet are attached to the equipment. Skis and bindings are the same on each foot—you can put either ski on either foot. But snowboarding requires the rider (or rental shop) to set up the bindings to face to one side or the other, depending on the riders natural “direction”. “Regular Foot” riders place right foot forward for the “normal” direction, and “Goofy Foot” riders (a term originated by surfers) place the left foot forward. As you progress to intermediate, you will learn to easily ride opposite your “natural” direction, and this is called riding “switch” (sometimes called “fakie”). How do you determine what is your natural “direction”? I think the easiest method is to ask what foot you kick a ball with, and that is your dominant foot—which goes to the back (the tail end). I occasionally see exceptions to this “rule”, but not often. Poles: Skiing only. Two of them. Call them “poles”, not “sticks”. They should each have a wrist strap hanging down. Don’t get a rental pole that has a molded handguard instead of a strap. Pole length is important but not critical for a beginner. To size a pole to your height, turn it upside down and hold it underneath the round “basket”, standing in boots but not yet in skis. Your forearm should be level to the ground, and not angling up or down. Wrist straps are important and need to be held in a certain way to minimize the chance of thumb sprain if you fall down (for information, see “ski instructor”). When you rent equipment, keep your rental agreement in a safe place. And keep your eyes on your equipment. Cheap insurance is to use the lockers, or the equipment valet (valets are much more common at the larger western resorts). One trick with skis is to place one ski and pole at one ski rack, and the other ski and pole at a distant rack or around the corner of the ski lodge. Rarely do thieves want to steal one ski and pole. Snowboards are very easy prey, unfortunately. Ski/board cable locks are fairly inexpensive and give a little piece of mind. OK, you’ve got your equipment. Now what? Take a lesson. Take a lesson. Take a lesson. Take a lesson. Are you an intermediate or advanced skier or snowboard “rider” already? Take a lesson. Group lessons are inexpensive and will get your career started much more safely and smoothly. The downside of groups is you will only advance as fast as the slowest learners in the group—and sometimes it does get SLOW in a big group. And beginner groups will almost NEVER proceed up on the chairlift. Private lessons (which can include a group of friends or family) are a really good investment, for beginners and especially for intermediate (second or third day) or advanced skiers. In private lessons, feel free to request the type of instructor you wish: younger, older (experienced! ), male, female, for special needs, etc. Private lessons will progress as fast as you can handle the drills or tasks, and the feedback is much more focused and personalized. And private lessons usually have “lift privilege” so you get priority to ride the chairlift. Private lessons can take many formats depending on what you want: work on a specific skill? make beautiful round turns? ski/ride over bumps? (called “moguls) ski the steepest slopes with confidence? “carve” the edges into the snow like being on railroad tracks? ski more effectively in hard-packed conditions? (we don’t use the word “ice” in snowsports industry) perform basic tricks? explore the mountain and find secret stashes of best snow? learn to ski/ride all day without getting as tired? Out west, you might want to learn to ski amongst the trees, or in deep powder (the ultimate in snow sports is to experience deep “bottomless” dry powder. Deep powder is rare, but not completely unknown in North Carolina). Most, if not all, North Carolina resorts employ some instructors with over 30 years of teaching experience, and are certified by the Professional Ski Instructors Association, or the American Association of Snowboard Instructors. The highest levels of certification takes years of training and intensive testing (and money) to achieve. Certified instructors are required to take regular two-year updates, at a minimum. So, instructors themselves are always “taking lessons”, even after decades in the snowsports industry. What can you do to prepare for a lesson? I like to say “bring as many skills as you can to the table”. You consider yourself an athlete? It helps. ANY prior skill is good to have: soccer, running, walking, tennis, yoga, gymnastics, biking, equestrian, baseball, dancing, weightlifting, kayaking, martial arts, roller skating, surfing, skateboarding, etc. Just don’t tell me you “snowboard” on video games. Yes- I get that a few times a season from the kids, and they are being serious. If you have been sedentary for a few years, or if you realize you are out of shape, you should consider checking with a doctor before getting on the slope. Skiing and riding are designed to be active sports, and can be physically taxing. It helps to have good balancing skills, but one of the benefits of snowsports is that you will IMPROVE your balance. Any age is appropriate—seriously. I’ve had students in their 80’s – and I’ve known several instructors who were still teaching into their 80’s. Proper “stance” is key. The fundamentals are the same for skis or snowboarding. A “tall”, relaxed posture. No crouching down. Head is up. Say again? Head is up. Looking at where you will be wanting to go, not at your feet. You should feel comfortable just lightly bouncing up and down in your boots. Flex and unflex your knees and ankles nice and easy. Feel your shins press against the tongue of the boots. Feel like you are standing with more pressure on the balls of the feet — and never feel the boot pressing on the calves (sitting back = bad). Hand and arm movement should be minimal. “Quiet hands” = good skier/rider. And expanding on that thought… “Quiet upper body” is key. Instructors will offer advice on hand and body position that is most effective and makes you look like a pro. Most beginner lessons follow this format: meet and greet, introduction to equipment, introduction to proper stance, how to put on the skis/board, walking or pushing around on flat area, walking a few steps up and down the hill, using the poles to push forward and backward across the hill (skiing only), a little “sliding” or “gliding” run across the hill (gentle, slow, short), then more practice runs to get better and better with a bit more speed and finesse on each try. Helpful hints are given along the way, and the ultimate goal of a beginner lesson is to make some linked right and left turns. It is easier than you might think. Turning is HOW you control your speed, and it is HOW you stop. Turning is… everything. It is the ONLY reason that snowsports exist. And a proper lesson will also review safety guidelines, an overview of how to ride the lifts, and where and how to ski/ride after your lesson is over and as you progress to intermediate. After the lesson, take a little rest or snack break, drink some water, and then come back out on the slope and get some “mileage”, using your new skills. Most folks in a ski lesson can achieve the basic skills in 1 to 1 ½ hours. In my experience, snowboarding has a steeper learning curve on the first day, so expect that things won’t always “click” with your turns until at least into the second hour. But your first lesson is really is like learning how to ride a bike— you don’t forget it. What you learn in your first lesson will stick with you for a lifetime. The body never forgets the movement patterns. And the fundamentals you learn in a beginner lesson will still be the fundamentals you use for the next 50 years, as you become an expert. Instructors do work hard, and they are actually working for a fraction of the cost of the lesson. So if you had a nice lesson, and you had fun and learned some new skills, feel free to offer a tip. This is never expected but always appreciated. Feel free to request your favorite instructor for additional lessons, later on the same day, things easier on your body. As I see it, falling on the slopes can give you useful experience for if you encounter a fall situation in “real life” such as on wet grass or on an icy sidewalk. And as a final comment… Be sure to familiarize yourself with the Skier/Rider Responsibility Code, and the North Carolina Skier (and Rider) Act. This information is made available from by ski area, and is usually posted in public areas and on the trail map or resort brochure. Read and understand these points—they are extremely important and useful. Skier Responsibility Code 1. Always stay in control, and be able to stop or avoid other people or objects. 2. People ahead of you have the right of way. It is your responsibility to avoid them. 3. You must not stop where you obstruct a trail, or are not visible from above. 4. Whenever starting downhill or merging into a trail, look uphill and yield to others. 5. Always use devices to help prevent runaway equipment. 6. Observe all posted signs and warnings. Keep off closed trails and out of closed areas. 7. Prior to using any lift, you must have the knowledge and ability to load, ride and unload safely. Doug Washer has been teaching snowsports at Sugar Mountain Resort for 37 years. He and his wife Pam reside in Blowing Rock. Doug’s brother, Bruce, and sister, Carolyn Sinclair, both of Hickory, also were ski instructors at Sugar Mountain at one time or another.